Inspired by Dr. Seuss’ lovable and courageous storybook character, craft your own Lorax stick puppets and puppet theater! This fun project is a great springboard for conversation with kids — and creates excitement for the much-anticipated musical at The Old Globe, Dr. Seuss’s The Lorax, coming to San Diego summer 2018. This project is great for scissors skills, storytelling and imaginative play. Cut out each character and glue them to craft sticks. About 2-3 inches from the top and each side panel, use a craft knife (parent’s job) to cut an opening of at least 11 x 14 inches in the center panel (this will be the puppet theater window). Decorate the theater with hand-drawn Truffula Trees and grass if you wish (see photo for reference). Optional: create tree tufts with colored pom-poms. The puppet theater can be used for other puppet shows—just create additional puppet characters! *Allow children to exercise their creativity and color the characters however they want. Please click the pictures above for 8.5 x 11 inch pdf files that can be printed for coloring and making puppets. 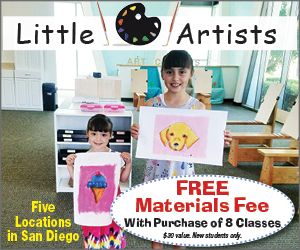 Alyssa Navapanich is a local art enthusiast who teaches art to elementary school kids in North County. Click here for more Lorax-inspired crafts, including goodie bags and Truffula Tree seed treats.